Consider the fan base at your school. 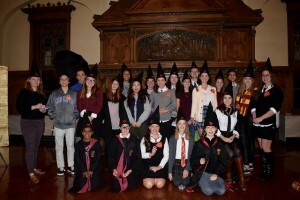 We toyed with a lot of fandoms for our first bookish event but ultimately landed on Harry Potter because we knew a lot of students would be interested. Others we considered (everything from Lord of the Rings to Chronicles of Narnia) had smaller fan bases or would likely appeal primarily to one gender. Drum up faculty/staff support from all areas of campus. For my event this meant getting event funding from the Student Activities Office, a camera from the Art Department, student photographers from the newspaper, and someone to hang floating candles from the Theatre Department. If you’ve picked your fan event well, others in your community will be excited to be involved. Get the students involved early. As soon as you decide on a theme and get the appropriate funding, get the students involved. As we all know, the best way to get students excited is word of mouth so rope in your bookish fan base early. Start with your book club, teen advisory board, or loyal patrons. 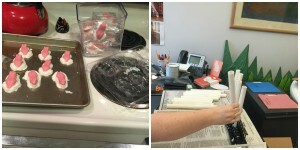 Our students helped over a long weekend constructing the Mirror of Erised frame and folded boxes for chocolate frogs. 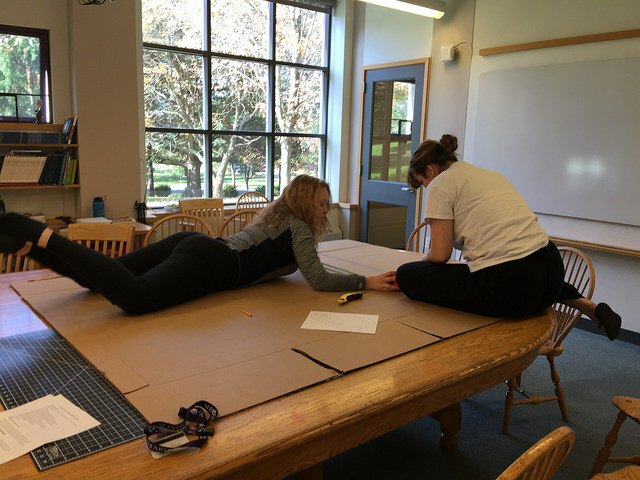 Students also volunteered during the free periods to help make signs, tie scrolls to the owl invitations, and to help sort students into their Houses. DIY what you can but don’t make yourself crazy. While I wouldn’t have had the final outcome any other way, my advice would be to save the DIYs for things that you really don’t have the budget to buy. Keeping track of all of the DIY moving pieces can be difficult. 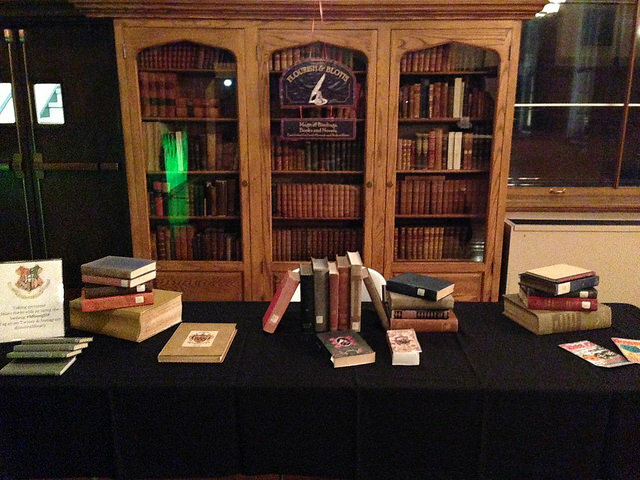 For my event, the library staff and I DIY’d almost everything. We made a Mirror of Erised, floating candles, floo flames, chocolate frogs, peppermint toads, house shields, table runners, not to mention a hat for each student in attendance. Figure out what you want to the be the focal point of the event and concentrate on that. 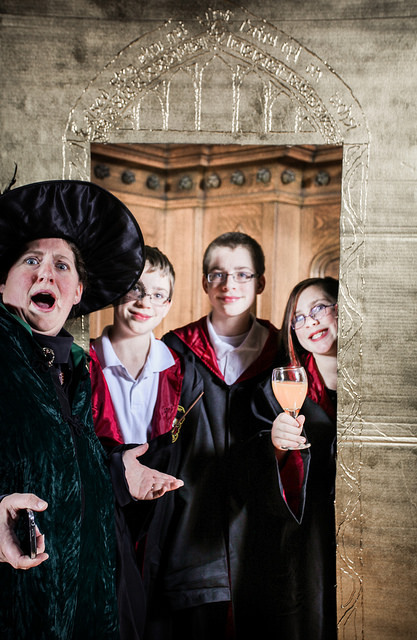 Especially with a fun theme like Harry Potter, it was tempting to make everything larger than life. However, when we really thought about what would make the biggest impact, it was clear that we needed to focus on making the sorting experience as “true to life” as possible. 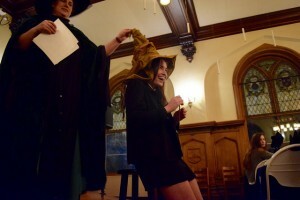 We were sure to play music from the first movie as students gathered and wrote our own sorting hat song that was pre-recorded by a willing faculty member. The sorting was run by a member of the theatre department dressed as Professor McGonagall. The little details, like having the hat speak to them, were what made the event special for each student. You’ll want lots of images of the event so be sure to plan ahead! Decide what images you want ahead of time and assign someone to make sure that they happen. Don’t forget to document your progress along the way. If you decide to do the event again, you’ll want to know how you did it! 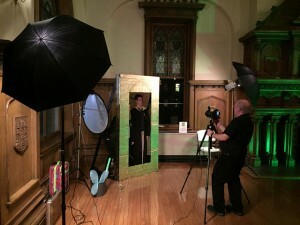 I wanted assigned student photographers to take pictures of the set up before we got started and asked them to take candid shots of students.We had two photobooths set up, the Mirror of Erised and the Floo Fireplace, one of which had a camera set up permanently. I posted all of the images to Flickr album afterwards so that students could access them. This ensured that we had access to the pictures and they weren’t all lost to Instagram and Snapchat! Since we sorted all of the students into houses and gave them house hats, I wanted to ensure we got pictures. At the end of the event we dismissed by House, each house taking a turn in front of the fireplace for a House picture! If you’re interested in hearing more about the event, feel free to contact me alexandra.m.patterson@gmail.com I am happy to share the tutorials we used to DIY things and answer any questions you might have! Love this idea. 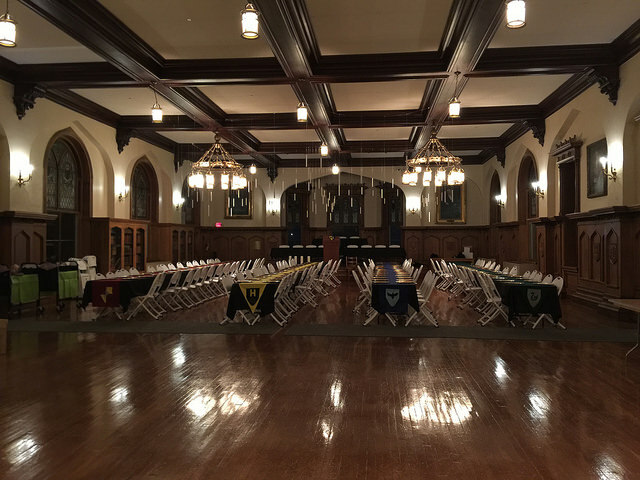 Funny, I worked at Mercersburg and as I was going through the pix, I realized that it was the Edwards Room where I had my wedding reception. Happy memories. I completely agree with getting your dining hall on board as well as other faculty members. People love a good party and excited students. Thanks for sharing an idea full of energy and fun! Love the idea to have a one time bookish event! This would be a fun idea for the 5-8 graders at my school — now to think about the book!